We're happy that one of our most popular prints, Queen Bee, is back in a luxuious cotton knit in a soft blue. Here's a pajama you will want to live in day and night. Check out our entire Queen Bee collection. Our popular "Sprinkle Dot" pajama is now here in a fresh and festive red. You might like the matching short set or nightshirt. Luxe Pima is an ultra-soft, super light tightly woven cotton. It is the highest quality fabric from The Cat's Pajamas and, like voile, is ideal for warmer climates or for people wanting a light, cool sleepwear set. You might like the matching short sleeve capri set. The Cat's Pajamas searched the globe for the perfect knit fabric for their pajamas. They started with hand-pulled Peruvian Pima cotton, which is known for its silky luster and unbelievably soft hand. They combined this Pima cotton with Modal to get the perfect drape and added Elastane to give it stretch and recovery so they look and feel great with every wear. These PJs are so luxuriously soft you'll never want to change out of them. You might like the matching shorty pajama set or nightshirt. The Cat's Pajamas searched the globe for the perfect knit fabric for their pajamas. They started with hand-pulled Peruvian Pima cotton, which is known for its silky luster and unbelievably soft hand. They combined this Pima cotton with Modal to get the perfect drape and added Elastane to give it stretch and recovery so they look and feel great with every wear. These PJs are so luxuriously soft you'll never want to change out of them. This sprinkle dots print is a print perfect for year around lounging. This classic shorts set is a soft pima knit you will love. Check out our sprinkle dots classic pj set or nightshirt. The Cat's Pajamas team searched the globe for the perfect knit fabric for their pajamas. They started with hand-pulled Peruvian Pima cotton, which is known for its silky luster and unbelievably soft hand. They combined this Pima cotton with Modal to get the perfect drape and added Elastane to give it stretch and recovery so they look and feel great with every wear. These pj's will become fast favorites just in time for Spring. You might like the matching robe. The Cat's Pajamas team searched the globe for the perfect knit fabric for their pajamas. They started with hand-pulled Peruvian Pima cotton, which is known for its silky luster and unbelievably soft hand. They combined this Pima cotton with Modal to get the perfect drape and added Elastane to give it stretch and recovery so they look and feel great with every wear. The Cat's Pajamas team searched the globe for the perfect knit fabric for their pajamas. They started with hand-pulled Peruvian Pima cotton, which is known for its silky luster and unbelievably soft hand. They combined this Pima cotton with Modal to get the perfect drape and added Lycra to give it stretch and recovery so they look and feel great with every wear. You might like the matching short sleeved capri pajama set. The Cat's Pajamas team searched the globe for the perfect knit fabric for their pajamas. They started with hand-pulled Peruvian Pima cotton, which is known for its silky luster and unbelievably soft hand. They combined this Pima cotton with Modal to get the perfect drape and added Lycra to give it stretch and recovery so they look and feel great with every wear. The Cat's Pajamas searched the globe for the perfect knit fabric for their pajamas. They started with hand-pulled Peruvian Pima cotton, which is known for its silky luster and unbelievably soft hand. They combined this Pima cotton with Modal to get the perfect drape and added Elastane to give it stretch and recovery so they look and feel great with every wear. You might like the matching robe. he Cat's Pajamas team searched the globe for the perfect knit fabric for their pajamas. They started with hand-pulled Peruvian Pima cotton, which is known for its silky luster and unbelievably soft hand. They combined this Pima cotton with Modal to get the perfect drape and added Lycra to give it stretch and recovery so they look and feel great with every wear. 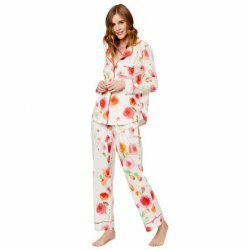 You might like the matching capri pajama set or robe.